With Hemmings Sports & Exotic featuring the multiple generations of the 115-chassis Alfa spider on their cover this month, is it long until people realize that, at least in North America, these are a stunning bargain you can get in several flavors? Yes, they were outdated when new, and yes, they’re prone to rust and have that oh-so-horrible Italian driving position, but honestly, do you care about those things in an occasional driver? 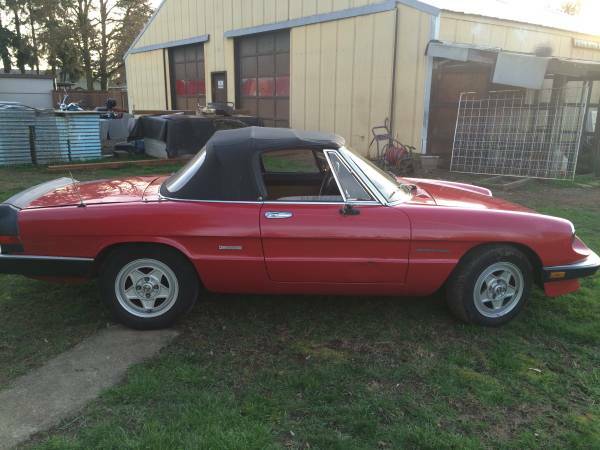 All that considered, if you’re looking for a spider that offers all that and still undercuts the market, it might be worth a look at this 1989 Alfa Romeo Spider Veloce for sale for $2800 in Salem, OR. Assuming little or no rust, which is not a big assumption on the west coast, this car is a pleasant mish-mash of sixties bodywork, eighties add-ons, and late-1980s engine management reliability and ease-of-use. The red paint is not the most creative choice on an Italian sports car, but it looks in fairly good shape, and does a good job disguising minor flaws. 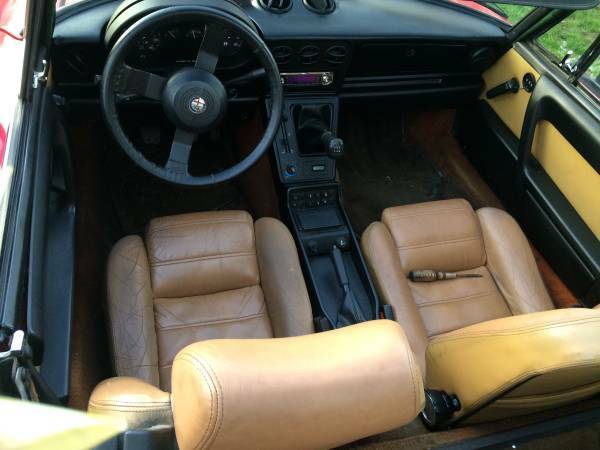 The seller’s description is pretty brief – the car is said to run and drive well, and the seller goes so far as to say it’s good for summer road trips (hopefully he’s put that to the test and can report how it went). Looking more closely, you can see a minor dent above the Pininfarina badge, a top that doesn’t seem to go down all the way, and a misaligned trunk lid. Oh, and it has an engine, which is probably what the hood’s position is meant to show. Looking at the right side, we can see a top in mostly good shape – what’s that above the vent window? – and a clean, straight body with clean wheels and some oxidation on the black trim. Also, the passenger mirror is missing, so figure on a call to Alfa Parts Exchange. Some oxidation on the nose is apparent – possibly an accident repair with lesser-quality paint that is now fading, or eighties bra damange. Check underneath, of course, and knock to make sure it’s not solid bondo, but initial impressions still hold. K-Jetronic fuel injection means this should be pretty amenable to daily driving work – some late 1989 cars may even have the Motronic of the final generation. No tears in the leather, though the carpet looks to need cleaning, but it’s all complete and with an uncracked dash too! There are some signs of wear, including the loose driver’s door cap and slightly warped glove box door, and of course the creasing in the seats. You’ll probably want to spend some quality time feeding the leather, but it doesn’t look bad otherwise. 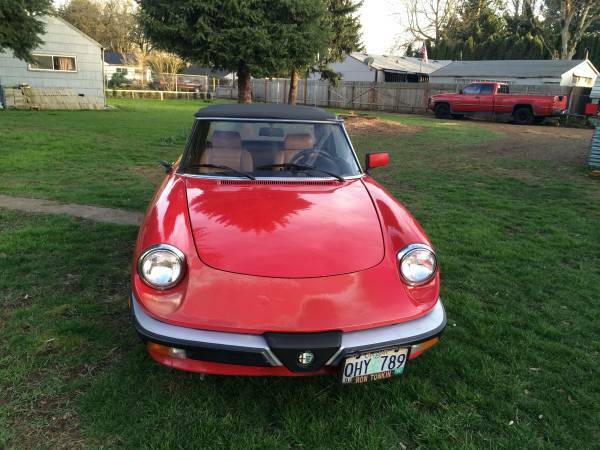 If you’re looking for a low-budget entry into the world of Italian cars, and don’t mind cleaning electrical grounds as part of regular maintenance (the source of most electrical issues on an Alfa), this one’s worth a look. This entry was posted on March 25, 2015 at 12:11 pm and is filed under Feature. You can follow any responses to this entry through the RSS 2.0 feed. You can leave a response, or trackback from your own site. The Series 3 Spiders, especially the 86-89 years, are the least expensive of the 4 series of Spiders. The decklid spoiler and the monopod dash were not all that well received. The odometer in monopods had a tendency to fail. The actual condition here is much more important than what’s on the clock. Rockers and floors should be inspected for rust, check for headgasket/compression. Oil in water is not desirable but not as bad as water in oil. I got some heat on BaT regarding Alfa’s infamous 2nd gear grind. Yes, it is common and no, it’s not the norm with 105/115 cars. All it’s saying is the synchro is on its way out. Also, check to make sure the car doesn’t pop out of reverse. Those serious about Spider or any Alfa should go to Alfabb.com a real Mecca for the Alfisti. 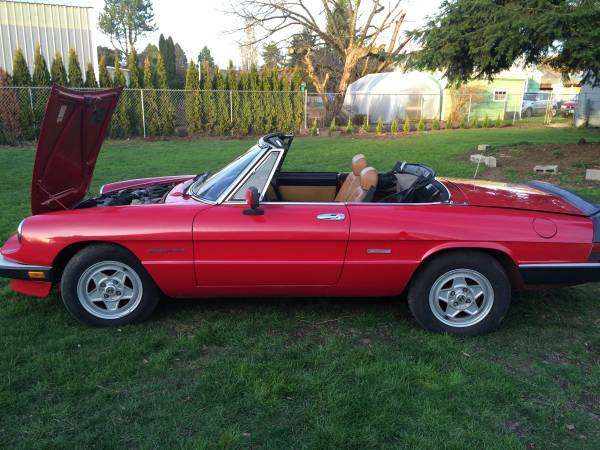 Alfa Romeo was of the best kept secrets in the US. The market only recently woke up to early 105/115 sedans, coupes and cabrios. The series 3 cars are the one to grab right now. Personally in series 3 I’d prefer 83-85 as the last of the 115 spiders with twin pod dash I’d also swap up the ‘duck tail’ spoiler for a low profile Zender kit. It completely changes the overall appearance of this model.